Tidewater Southern 200 is a wooden, double-truck, double-end, arch-roof, three-compartment combination car. The Tidewater Southern Railway ran from Stockton to Modesto, California a distance of 33 miles. The Jewett Car Company of Newark, Ohio built car 200 in 1913. TS 200 was one of three nearly identical cars in the 200 to 202 series. These were the only electric passenger cars the TS ever owned. The Tidewater Southern used an overhead trolley that ran at 1200 volts DC. Passenger service ended on May 26, 1932. When passenger service ended the trolley wire was removed except for two miles in Modesto, where the franchise did not permit the use of steam locomotives. 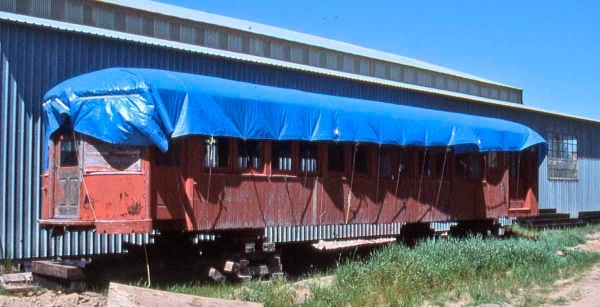 After the end of passenger service car 200 was first used as a caboose and then, with trucks removed, as a shed. The car was acquired by the Museum in 1979. Technical Data: Wooden interurban combination coach. Built by Jewett Car Company of Newark, Ohio built the car in 1913. Seats, 46 passengers. Weight. Trucks: (Brill 27MXB3). Wheels, 36 inch. Axle. Journals, 5 X 9. Traction motors, 4-65 horsepower @ 600 VDC, inside hung. Air Brake Equipment: Westinghouse Traction Brake. Motorman’s valve. Emergency valve. Double check valve. Brake cylinder. Air compressor. Dimensions: Width, 9’ 4 1/2”. Length over buffers, 51’ 0”. Truck centers, 29’ 0”. Truck wheelbase, 78”. Propulsion Equipment: General Electric type M. Master controller. Switch group. Traction motors, (GE 201G). Control switch. Power resistors. MU plugs. Misc Data: Couplers, (Janney radial MCB contour). Heaters. Trolley wheel. Trolley base. Current Condition: This car is a stripped body with considerable wood rot in one side. Proposed Future Treatment: Restore car when resources are available. Trucks and motors are currently available.